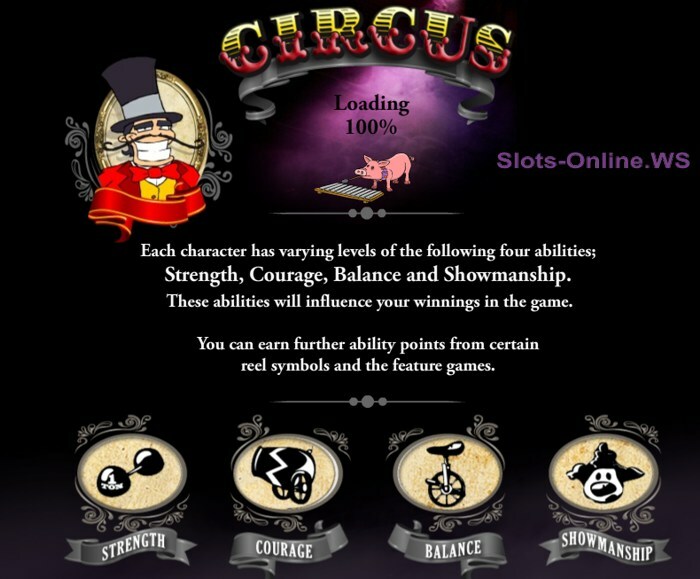 Circus is a new 5 reel, 20 payline slot machine with Wild & Scatter symbols, unique ability feature, interactive characters and 16 exciting Bonus Feature games. 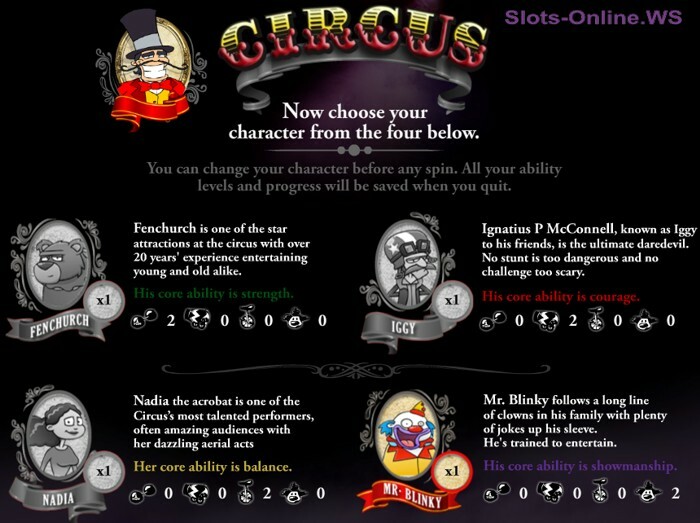 The world's first role-playing slot, Circus is probably the most entertaining slot games developed by PartyGaming to date. 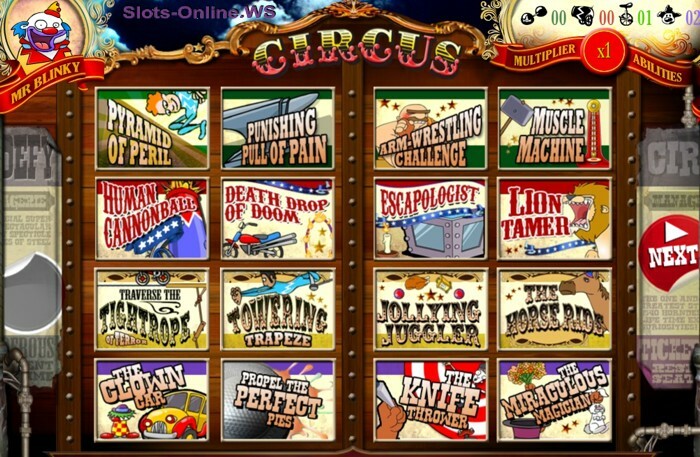 This spectacular online slot with popular Circus theme offers 16 exciting, interactive bonus games with unique storylines to take you through the cash-grabbing circus adventure. At the beginning of the game you choose from 4 memorable characters - Nadia, Fenchurch, Ignatius P McConnell (IGGY) or Mr. Blinky - every character has varying levels of the following abilities: Strength, Courage, Balance, Showmanship. These abilities will influence your winnings in the game - you collect points working as win multipliers (see images below). You can change your character before each spin! 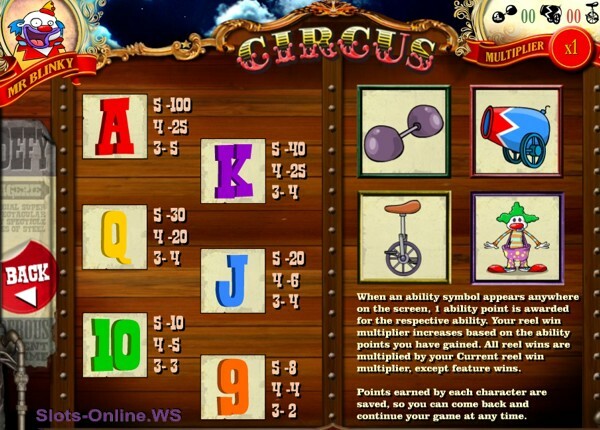 Every feature in Circus has been made bigger, better and more exciting than other online slots. You will also be amazed with the excellent graphics and sound effects. Step into the shoes of the lion tamer, acrobat, magician and other classic circus roles as you try to win all the big money in the dazzling bonus games. Coins: The minimum bet amount in Circus is just $0.01 and the maximum wager can be set at $400.00 if you bet max on all 20 pay-lines. Don't be fooled with the "small" 1,000 coins top jackpot - with the ability multipliers you can win up to 5,000 coins (or $100,000.00) per spin in the base game alone plus extra cash in the bonus rounds. 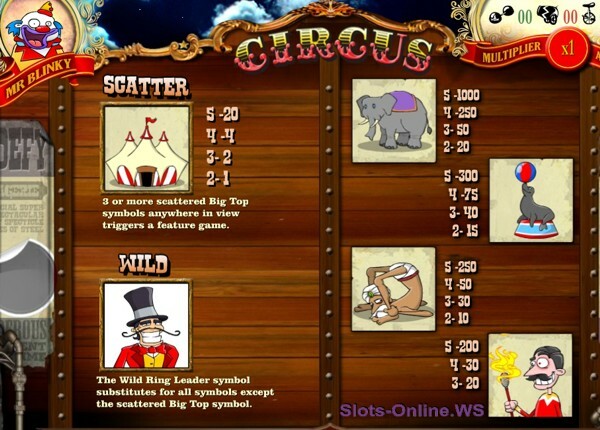 Scatter: The Big Top symbol is a Scatter; two or more Big Top symbols deliver a cash prize (1x up to 20x total bet) and 3 or more of them activate the feature game. Wild: Ring Leader symbol is wild and substitutes for all other symbols except Scatter Big Top. Other symbols include Elephant, Seal, Acrobat, Magician, and traditional A to 9 symbols. A feature is triggered when 3 or more scattered Big Top symbols appear anywhere on the reels. You have to choose one of the 16 different bonus games: Pyramid of Peril, Punishing Pull of Pain, Arm-Wrestling Challenge, Muscle Machine, Human Cannonball, Death Drop of Doom, Escapologist, Lion Tamer, Tightrope, Towering Trapeze, Jollying Juggler, The Horse Ride, The Clown Car, Propel the Perfect Pies, The Knife Thrower and The Miraculous Magician. Every feature has different rules and require different skills. Try 'em all! Circus saves your game progress as you go, meaning you can return any time and continue where you left off. You can even start a second, third or fourth adventure with a different character for even more fun and rewards. 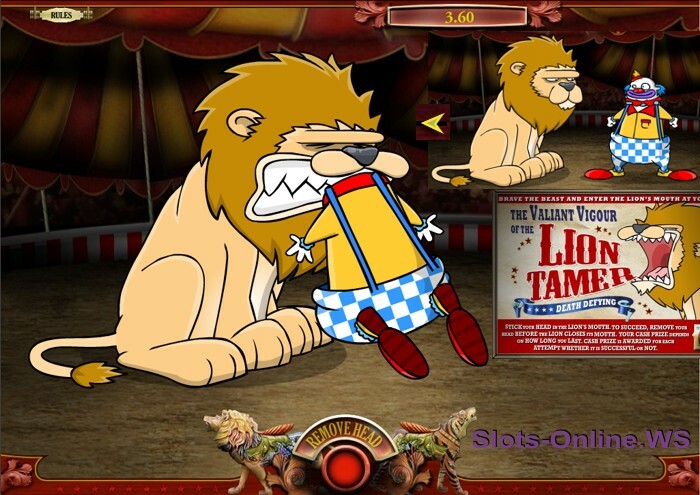 I've tried Lion Tamer bonus game with Mr. Blinky. You need to stick your head in the Lion's mouth and remove your head (if any) before the Lion closes his mouth. Click the Remove button - act quickly, otherwise you can loose your possible winnings. 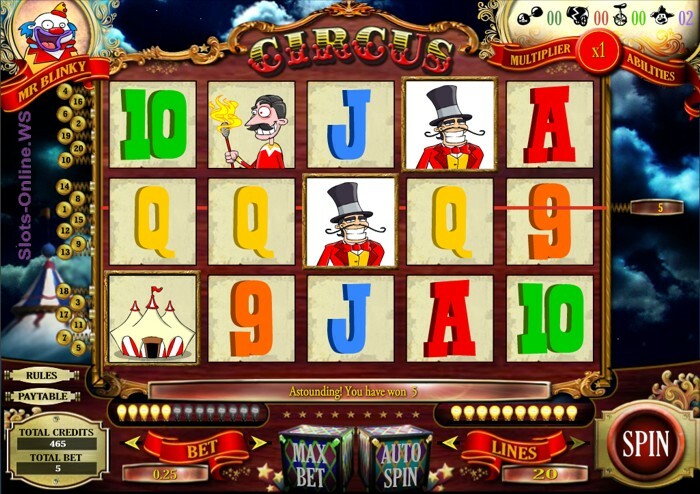 You've never played anything like The Circus - download the slot now and discover thrilling plot developments, enjoy rewarding bonus round games and increase your abilities to raise your win multiplier for awesome cash prizes. Party Casino - Claim 100% match bonus up to $/€3,000 free on 4 first deposits. Play unique movie-themed bonus feature slot machines..
Million Cents HD - 20 Line Slot from iSoftBet. Fat Cat Mobile - Bonus Feature 20 Line Slot from WGS. Doctor Love Mobile - Free Spins 20 Line Slot from WGS. Big Top Slot - 9 Line Slot Machine. Money Magic - Progressive 9 Line Slot Machine. 5 Reel Circus - Free Spins 15 Line Slot Machine. Carnaval Promotions And Cash Draws At CasinoRewards Casinos. This week the annual Carnival of Venice is taking place in the famous Italian..
Cash In Your Spins At PartyCasino - Race To The Top Of The Circus For Your Share Of $150,000. Party Casino has launched new Circus Slots which we..